Long time Ruins drummer Tatsuya Yoshida is the master of the instantly inventive. Across multiple real-time collaborations with a who’s-who of the improv scene, his flair for spontaneous hot flashes is recognized as a volatile but thoughtful element of any ensemble’s interplay. 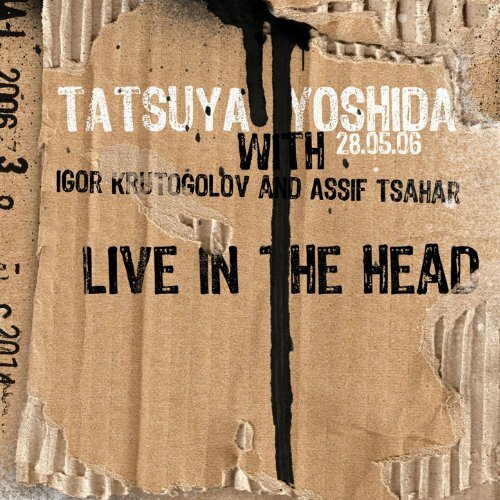 Live in the Head finds the percussionist in two distinct settings the first playing off the double threat of Israeli bassist/composer Igor Krutogolov and tenor sax man Assif Tsahar. The live dialog is fierce and furious across the six joint pieces created by the trio line-up sparking easy comparison with the downtown New York scene perpetuated by the likes of Steve Lacy and Rashied Ali. The trio can be whimsical and boisterous (“Improvisation II”), laid back and grooving (“Improvisation VI”), or spurious (“Improvisation VI”). The second part of the album focuses on Yoshida’s composed solo work settings which are just as vital and frenetic. The first two tracks on the disc take a few pages from the Magma school of intensity while the Untitled pieces stand out in stark contrast as best of the recording showcasing some great keyboard and synth work. “Improvisation VII” relies on more the choppy unisons which fuel much of the sessions while the album’s brief closer, “Dhaskrive” shows that Yoshida has the mindset for going out in a literal blaze of glory. Overall Yoshida consistently demonstrates a high interchangeable proficiency for both free and composed performance that’s undeniable.